Consider how much you will spend on holidays and trips in the future and I'm sure you'll agree that this software is real bargain at just $17 $7! 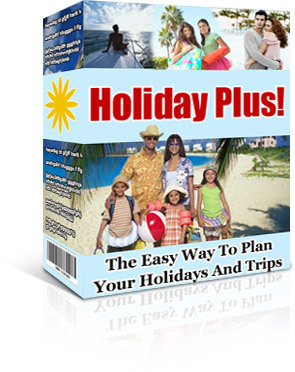 Despite the amazingly low price of this package, I know you may still have a few lingering doubts as to whether Holiday Plus will really work for you. If at any time within the next 30 days, you decide that Holiday Plus doesn't meet your needs, just send me a quick email and I guarantee to refund your money in full, no questions asked. You'll receive instant access to your software and ebooks by Internet download, even if it is 2am in the morning.